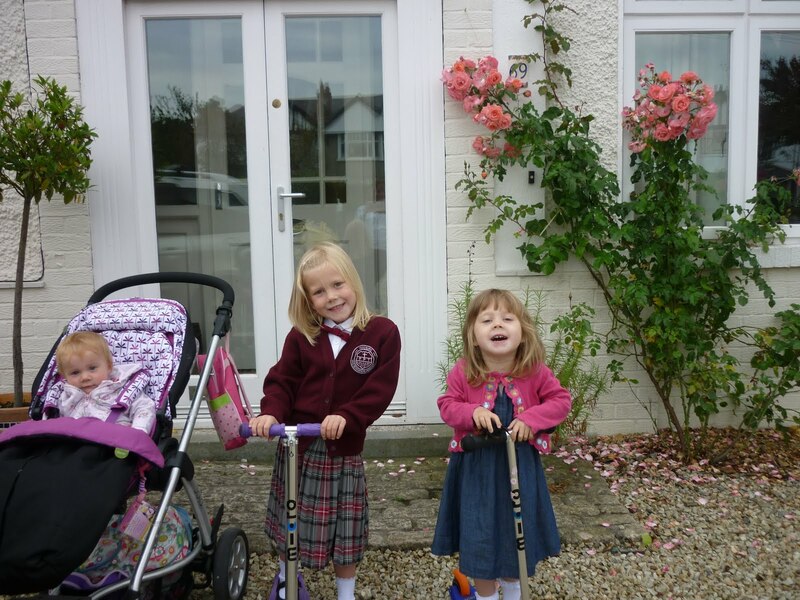 Yesterday the girls went back to school and playschool. Uniforms dusted down from the wardrobe; new white socks in squeaky new shoes; hairs cut and washed; schoolbags eventually found, emptied, cleaned and repacked; breakfast table set. As we left, I took a photo by the front door as I always do to mark the beginning of a fresh start. Last night I sent it to my mum, along with last year’s picture. What a difference a year makes. Yesterday, Daisy a little older and a lot wiser. No tears, no fear, only excitement and anticipation. A new haircut, shorter, more manageable, a little older. She has grown into her uniform, no longer looking quite like Orphan Annie with a skirt to her ankles and sleeves past her fingertips. And Poppy…. how she has changed, and grown and blossomed. A little taller, a lot happier. A new haircut, shorter, more manageable, a little older. She has grown into her skin, no longer suffering from malnutrion, her gluten free diet nourishing her body and mind. And of course, the new addition. Ruby. Bursting from my belly last year, now a glorious bouncing, busy, boisterous baby. When I look at last year’s picture… I remember the promise in my life. Three weeks later my baby would be born. I was full of plans and projects. My mum would help me through the first few weeks, and we would sit wrapped in newborn love, proud and pompous with the delight of our lives. We had holidays planned, excitement brimming with the thoughts of the year ahead. Instead the promise was destroyed, as the blood seeped into her brain and destroyed her memory, her voice, her life. But…. as I look at this year’s picture, I must remember I have new promise. The girls growing and glowing all the time. Ruby, a mystery minx, revealing her character and cuteness every day. A new year to learn, and grow and love. My mum is still part of my life. The love she gave me every one of my 41 years, will keep me going for the next 41, seeing the promise in life every day.